HomeFeaturedSimon Says: What’s Better, Heavy or Light Sparring? 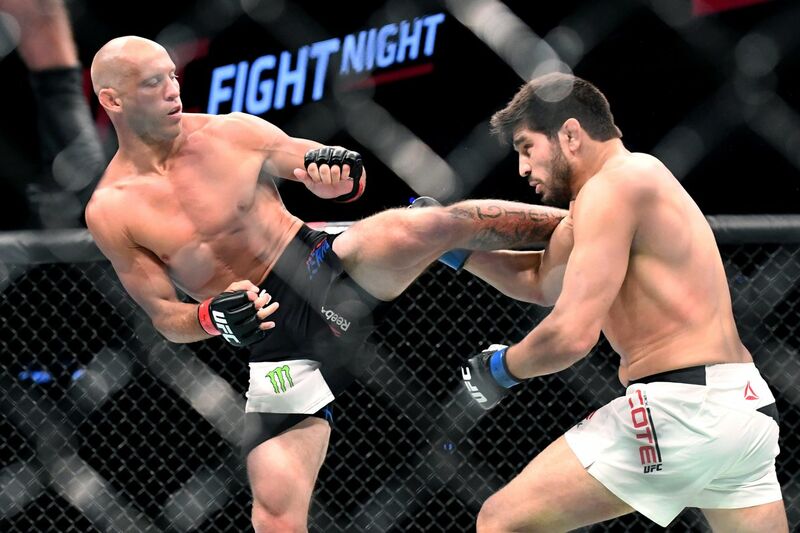 What do Donald Cerrone, Robbie Lawler, and Carlos Condit have in common? Each have either entirely eliminated or severely reduced the frequency with which they spar in and around training camps. These fighters are among the most notable examples of athletes moving toward smarter and safer training. Lets make a clear distinction between the varying degrees with which training fighters spar. There is the classic or traditional Nova Uniao type of sparring where the difference between a fight and a sparring session is a matter of location. Then there is the slow and methodical “new age” or “light” sparring where fighters drill certain combinations and focus heavily on technique. There are of course shades of grey in between these two broad categories but lets examine the costs and benefits associated with each. Gym wars or traditional methods of sparring aim to exactly replicate the conditions of a fight. With the possible exception of headgear, shin guards, and other protective measures, these types of sparring sessions are often little more than unofficial fights. The obvious benefit to this system of training is the comfort it affords a fighter when the bright lights come on. A fighter who spars very “heavy” has a lot more experience than their record might show. Furthermore, that fighter knows their strengths and weakness – how much punishment they can take – and that practical knowledge is invaluable in the heat of the moment. The main drawback of this type of sparring is what some would call the “needless” miles it places onto a fighter’s odometer. Heavy sparring can shorten the duration and quality of a fighter’s career. A beaten up body can mean worse performances and an eventual inability to compete. Obviously the ability to take a shot is the primary consequence of heavy sparring. So are the benefits worth the eventual costs? Light sparring claims the same benefits of heavy sparring, though perhaps not to the same extent, and offers less discernable consequences. The idea behind light sparring or a type of drilling with a sparring partner is to consolidate muscle memory. Just as a fighter who spars heavy knows instinctively what to do in a fight so too does the fighter who spars lightly. Drills, combinations, take-downs, and other maneuvers are ingrained into the athlete’s brain and that brain remains relatively undamaged because of the lower and lesser instances of contact. Apart from those traditionalists resisting change and claiming light sparring to be effeminate, the major concern about this system is that it simply isn’t sufficient. Only the replicating a fight as closely and as “safely” as humanly possible can truly prepare one for when the bell rings. Moreover, an inexperienced fighter who spars lightly doesn’t know their limits or abilities. They wont be able to adapt or perform under pressure because that experience is alien to them. Stephen Thompson is a big supporter of light sparring, “Once you lose that chin, you can’t get it back.” Click image for related article. Any an all coaches and fighters tout sparring as essential to training MMA though that necessity is thought to diminish after a certain point in an athletes career. For veterans like Cerrone, Lawler, and Condit, there is no need for heavy sparring in and out of camps. At this point in their respective careers the only thing traumatic training will accomplish is a shorter window for achievement. Sparring is a routine part of a mixed martial artist’s life. Some athletes spar as frequently as every day and some only once a week or less. When you consider the frequency of these events it becomes clear that the “quality” of these sessions is extremely important. While heavy sparring is important early on in an athlete’s career there is a point of diminishing returns at which the only thing to be gained is injury and brain trauma. Ultimately it is up to the fighters and their coaches to decide upon a course of action. As of late, it appears that many of the sport’s elite are increasingly turning towards lighter, safer, and smarter sparring.